Sammy Lees Motors are delighted to welcome into stock this 2015 65 Plate Mini Cooper S with 189 BHP. Finished in the head turning Electric Blue which is perfectly complimented by a half Black leather & Tartan cloth upholstery with 17" 10 spoke alloy wheels. Since the MINI was resurrected in the early 2000s,it has traded on its characterful, retro design, customisation options and what is often described – both by MINI itself and by those who drive its cars – as go-kart handling. The Cooper S takes the MINI into the realms of the sports car. Acceleration is rapid, but this petrol engine is also extremely economical with Mini claiming it will return on average 49.6 miles per gallon, with lots of power across the rev range. This vehicle benefits from a full detailed Mini service history & comes with a Mini TLC package which covers all servicing requirements for 5 years or 50,000 miles as well as 1 years full FREE in house warranty - offering complete peace of mind. This immaculate & high specification vehicle comes with: - * Sat Nav, * Bluetooth Connectivity, * Excitement Pack (Mood Lighting) , * Cruise Control, * DAB Radio, * Dual Zone Climate Control, * Mini Cooper S Embossed Scuff Plates, * Leather Multi Functional Steering Wheel, * Rear Roof Spoiler, * Automatic Headlights, * Front Fog Lights, * Key Less Push Button Start, * Black Cloth Headlining, * Drive Select, * Rear Privacy Glass, * Auxiliary Point, * USB Point, * Sport Chrome Foot Pedals, * Front Electric Windows, * ISOFIX, * 2 Remote Control Key Fobs, * Mini Handbook Pack + Much More! With a range of trim levels available, as well as three and five-door versions of the MINI Hatch, there truly is a model to suit every driver. 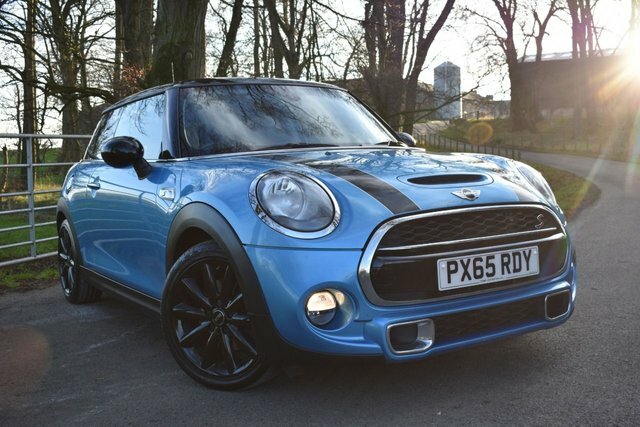 You'll be able to find a great selection of used MINI Hatch Cooper models for sale in Appleby In Westmorland right here at Sammy Lees Motors Ltd. We are a leading supplier of quality and affordable used vehicles and you can trust our team to provide you with reliable and impartial guidance. Take the opportunity to view our complete stock online and be sure to pay a visit to the showroom in person when you're ready to take a test drive. Finance is available to UK residents aged 18 years or older, subject to status. Terms & Conditions apply. Indemnities may be required. Other finance offers may be available but cannot be used in conjunction with this offer. We work with a number of carefully selected credit providers who may be able to offer you finance for your purchase, commission may be received. We are only able to offer finance products from these providers. Postal Address: Sammy Lees Motors Ltd, Esperanto Way, Cross Croft Ind Est, Appleby in Westmorland, Cumbria CA166HX. Find contact details here. Sammy Lees Motors Ltd is authorised and regulated by the Financial Conduct Authority, FRN: 783615. All finance is subject to status and income. Written Quotation on request. We act as a credit broker not a lender. We work with a number of carefully selected credit providers who may be able to offer you finance for your purchase. We are only able to offer finance products from these providers.